1) GRAND PRIX: Doraemon , the sci-fi robot cat character much beloved by all Japanese children. Fujiko F. Fujio, Doraemon's creator, passed away early in the year, so his widow represented him at the ceremony. It would be hard to overestimate the impact that Doraemon has had on several generations of Japanese; he's a true cultural icon at this point. 2) AWARD FOR EXCELLENCE: Zankoku na kami ga shihai suru ["A cruel god dominates"] by Moto Hagio (runner up). This is a gripping shojo; ["young girls"] story compiled into a long paperback series as part of Shogakukan's "Petite Flower" line of books. It's the tale of a young boy who is sexually abused by his step father and various others in his life, and a great example of how the manga format can be used to depict something as complex as the destruction of the human ego. 3) SPECIAL AWARD: Mr. Minoru Naiki won the "special contribution" award for his Gendai Manga Toshokan (Modern Manga Library), which has been the sole place in Japan where researchers can read old manga for a small fee. Like almost every manga researcher, I personally am indebted to Mr. Naiki and his library. After the presentation of the awards there were short speeches by the award recipients, words of greetings from luminaries such as Etsuko Tezuka, the widow of Tezuka, and representatives of the Asahi organization, and then toasts and comments by acquaintances of the winners. In a way, it reminded me of the testimonials given at Japanese weddings by friends, family members and coworkers. After that it was a matter of snacking and drinking around the huge, ice-sculpture decorated buffet tables. I had myself photographed with Go Nagai, Leiji Matsumoto, Abiko, and other stars, and I hope the photos come out! The vast majority of the people in attendance were extremely well dressed, but I didn't feel so bad about not wearing a coat when I saw a couple of the celebrities. Toshio Okada, also a nominating committee member, had on a loud Hawaiian shirt; Leiji Matsumoto was dressed exactly as he's been dressed for the last twenty-five years, with his safari jacket and his black skullcap emblazoned with a pirate emblem. While I was in the midst of chatting with some people, I was dragged up on the stage and asked to say a few words. Not having any thing prepared I did the best I could but felt like-- and probably sounded like-- an idiot. Nonetheless, it was a great deal of fun, and an honor to be able to attend. Unfortunately, none of the works I nominated won a prize, but one-- Ping Pong by Taiyou Matsumoto-- at least made the first cut. This year I didn't make it to the Tezuka Award ceremony in Japan, but here are the announced winners. 1) GRAND PRIX: "Botchan" no Jidai, by Natsuo Sekikawa and Jiro Taniguchi. This is a wonderful series about the literary and intellectual world in Japan's Meiji period. It's published as part of a five volume series by Futaba-sha (after a decade-long serialization in Manga Action magazine, and each volume is a hefty 300+ pages bound with tastefully designed covers. The Meiji period (1868- 1912) was a extremely pivotal period in Japan's history, when the country changed from a feudal state to a modern industrial nation. "Botchan" no Jidai shows how this period forms the basis of much of modern Japan's identity. An extremely literate manga, reading "Botchan" no Jidai feels like reading a Meiji period novel. I can't recommend it highly enough, although for students of Japanese language it is probably much more difficult than most manga, as there are few pronunciation keys for the more difficult kanji. Natsuo Sekikawa is a primarily non-fiction writer who has authored many fine books on a wide variety of subjects, ranging from Korea to manga criticism. Jiro Taniguchi is a veteran manga artist who has created several other highly acclaimed manga with Sekikawa. He is famous, among other things, for his hard boiled action series, and also several series about animals. In 1992, he won the 37th Shogakukan Manga Award for his series, Inu o Kau ("Owning a Dog"), and in 1993 he and Sekikawa also won the Japan Cartoonists' Association Award of Excellence for "Botchan" no Jidai. In the United States, in 1990 Viz Communications published another fine work by Sekikawa and Taniguchi, titled Hotel Harbor View. Both Sekikawa and Taniguchi are also mentioned briefly in my 1996 book, Dreamland Japan. 2) AWARD FOR EXCELLENCE: Naniwa Kin'yuudou ("Naniwa Financiers"), by Aoki Yuji. Serialized weekly in Kodansha's adult magazine manga, Morning for many years starting in 1990, this tale of loan sharks in the Osaka area reads almost like a Fyodor Dostoyevski novel. It's also drawn in a completely original, blocky neo-primitive style. In reading this work you can learn more about the street level Japanese economy than in reading a dozen textbooks. My book, Dreamland Japan has four pages in English on this very important work; a small part of the manga also appeared with an English translation in the alas now-defunct magazine Mangajin (issues 34-40). 3) SPECIAL AWARD: This year's special award was postumously granted to Shotaro Ishinomori, who passed away January 28, 1998, for his great contribution to both manga and the manga industry. It was a logical choice. Ishinomori was one of the all-time greats of Japanese comics. A brilliant protege of Osamu Tezuka, he was a pioneer in the "production" system in the manga world, and as a result was able to turn out an extraordinary large number of works. At one point he held a record of sorts for churning out 500 pages per month. Some of his most famous works include Cyborg 009, Hotel, and Introduction to the Japanese Economy (The Comic Version). Like Tezuka, he was an extraordinarily active man, and drew in a wide variety of fields, ranging from boys' and girls' comics to adult material, and played a major role in raising the status of manga in Japan to their current level, which is nearly equivalent to films and novels in other nations. Ishinomori was also active in the main manga-related organizations in Japan, and helped form the Manga Japan group, which focused more on artists of long, narrative works. During his life, he won nearly all the awards there are to win in the manga world. With his work on the Japanese economy, he almost single-handedly pioneered the now-huge genre of "information manga." Introduction to the Japanese Economy (The Comic Version) was published in the 1980s in English by the University of California Press under the title Japan Inc. , and at the height of American interest in the Japanese economy attracted great interest on the part of businessmen as well as manga fans. Subsequent volumes in the series are currently being issued by Lanchester Press. I always liked Ishinomori, and he was very kind to me when I interviewed him in the past. There is a photograph of him on p. 141 of my Manga! Manga! The World of Japanese Comics, in front of a little pyramid that he built on the roof of his house. At one point, he claimed, he used to enter his pyramid space in the hopes that it would stimulate his creativity with "pyramid power." But "instead of thinking up new stories," he lamented, "I usually wind up drinking sake and admiring the moon." As befits a good cartoonist, he also had a good sense of humor. This year's awards ceremony was held on June 9, 1998, at the Imperial Hotel. Although I couldn't attend, I was very pleased that both of the manga winners were works that I personally had also nominated. Others that I nominated that didn't make the final cut were Ping Pong, by Taiyo Matsumoto, and Spirit of Wonder, by Kenji Tsuruta. I had also nominated Isao Shimizu, the manga historian, for the Special Award, before learning of Shotaro Ishinomori's death. Here we go for 1999. 1) GRAND PRIX: MONSTER, by Naoki Urasawa. This is a fabulous adventure-suspense story, in the best tradition of lengthy Japanese story-manga. Originally serialized in Big Comic Original, then compiled into eighteen paperbacks, in 2004 it was also shown on television as an animated series. Urasawa is also famous for previous works such as his immensely popular judo-themed series, YAWARA!, etc. 2) AWARD FOR EXCELLENCE: Shindou("The Prodigy"), by Akira Sasou. A highly original story about a child prodigy with perfect pitch and a gift for playing the piano, issued as a four-volume series by the veteran manga publisher, Futabasha. 3) SPECIAL AWARD: Fusanosuke Natsume, a good friend, won the "special contribution" award for his extraordinary contributions to manga criticism. For years, Natsume has been explaining and analyzing the manga scene, in both Japan and overseas. Unlike other critics, however, he is himself a manga artist, and thus has been able to explain manga from the perspective of design and construction, as well as story. This year's awards ceremony was held on June 9, 1999. It was my last year to serve as a member of the nominating committee. This year had a strong personal aspect for me. 1) GRAND PRIX: Saiyuu Youenden ('The Monkey King' and other Chinese Legends), by Daijirou Moroboshi. Currently over sixteen volumes, created over a period of fifteen years, by one of the great artists of modern manga. 2) AWARD FOR EXCELLENCE: Dragonhead, by Minetarou Mochizuki. A hair-raising suspense manga about young students in an apocolyptic world after a train they're on is wrecked in a tunnel. Originally serialized in Young Action magazine and then compiled into ten paperback volumes, the story was also made into a live action movie in 2003. 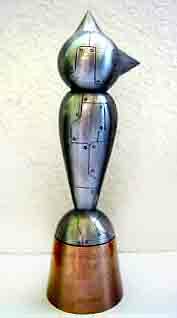 3) SPECIAL AWARD: None other than yours truly won the special award for 2000, for helping to popularize manga overseas. Having worked on the nominating committee previously, and having had a long affiliation with Osamu Tezuka himself, this was a huge honor for me. During my acceptance speech, delivered before a crowd of hundreds of contemporaries and manga luminaries, I nearly choked. Click HERE for my comments on the Asahi website, in Japanese. I cut off my hair for the ceremony. Please ignore the bad haircut! 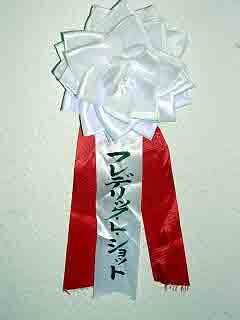 Here's a photo of the very cool award itself, and the special award ribbon that I wore. The awards ceremony was held on June 6, 2000.